April 19, 2016 / B3C newswire / —Agendia, Inc., together with the European Organisation for Research and Treatment of Cancer (EORTC) and Breast International Group (BIG), announced results from the initial analysis of the primary objective of the Microarray In Node-negative (and 1 to 3 positive lymph node) Disease may Avoid ChemoTherapy (MINDACT) study at the American Association for Cancer Research Annual Meeting 2016 in New Orleans, LA. Using the company’s MammaPrint® assay, patients with early-stage breast cancer who were considered at high risk for disease recurrence based on clinical and biological criteria had a distant metastasis-free survival at five years in excess of 94 percent.The MammaPrint test—the first and only genomic assay with FDA 510(k) clearance for use in risk assessment for women of all ages with early stage breast cancer—identified a large group of patients for whom five-year distant metastasis–free survival was equally good whether or not they received adjuvant chemotherapy (chemotherapy given post-surgery). The MINDACT trial is the first prospective randomized controlled clinical trial of a breast cancer recurrence genomic assay with level 1A clinical evidence and the first prospective translational research study of this magnitude in breast cancer to report the results of its primary objective. 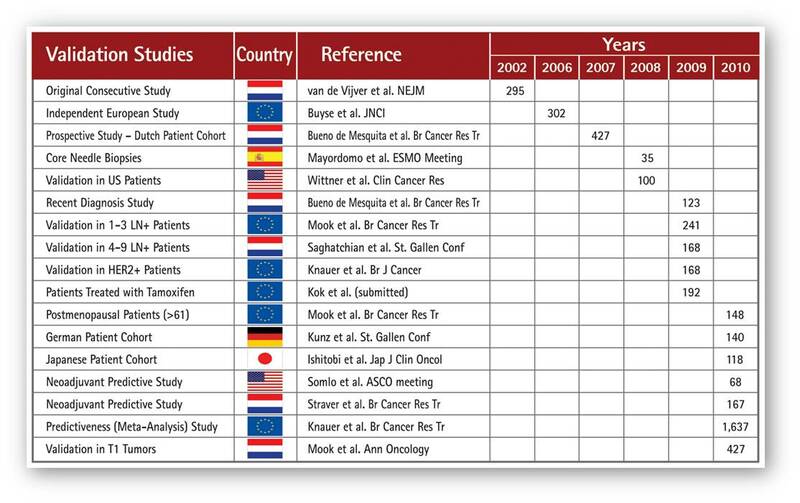 Among the 3,356 patients enrolled in the MINDACT trial, who were categorized as having a high risk of breast cancer recurrence based on common clinical and pathological criteria (C-high), the MammaPrint assay reduced the chemotherapy treatment prescription by 46 percent.Using the 70-gene assay, MammaPrint, 48 percent of lymph-node positive breast cancer patients considered clinically high-risk (Clinical-high) and genomic low-risk (MammaPrint-low) had an excellent distant metastasis-free survival at five years in excess of 94 percent. MINDACT is a randomized phase III trial that investigates the clinical utility of MammaPrint, when compared (or – “used in conjunction with”) to the standard clinical pathological criteria, for the selection of patients unlikely to benefit from adjuvant chemotherapy. From 2007 to 2011, 6,693 women who had undergone surgery for early-stage breast cancer enrolled in the trial (111 centers in nine countries). Participants were categorized as low or high risk for tumor recurrence in two ways: first, through analysis of tumor tissue using MammaPrint at a central location in Amsterdam; and second, using Adjuvant! Online, a tool that calculates risk of breast cancer recurrence based on common clinical and biological criteria. Patients characterized in both clinical and genomic assessments as “low- risk” are spared chemotherapy, while patients characterized as “high- risk” are advised chemotherapy. Those with conflicting results are randomized to use either clinical or genomic risk (MammaPrint) evaluation to decide on chemotherapy treatment. The MINDACT trial is managed and sponsored by the EORTC as part of an extensive and complex partnership in collaboration with Agendia and BIG, and many other academic and commercial partners, as well as patient advocates. Breast cancer is the most frequently diagnosed cancer in women worldwide(1). In 2012, there were nearly 1.7 million new breast cancer cases among women worldwide, accounting for 25 percent of all new cancer cases in women(2).